It is through the Sacrament of Baptism, that we are freed from original sin and reborn as children of God. Baptism is the first of the three Sacraments of Initiation, First Eucharist and Confirmation being the other two, and begins our lifelong journey as disciples of Jesus Christ and members of the Catholic Church. You should be a registered member of St. Luke Parish. To register, you must fill out a census form. Census forms are available in the Parish Office, in the Narthex or via our website. You will need to register for and attend a Pre-Baptism Class. You will need to fill out the Yellow Baptism Form that you receive in class and secure the required Godparent Sponsor Letter(s), and return those to the Parish Office in order to secure a Baptism date. 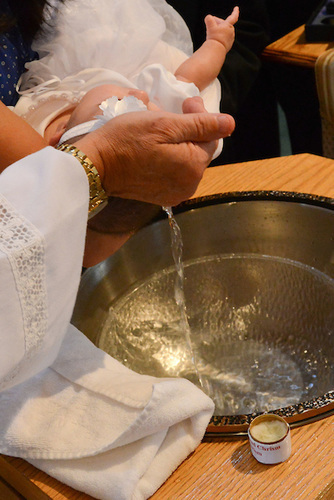 Baptisms are held on the First and Third Sundays of the month at 1:30 pm. Please arrive a minimum of 15 minutes before the Baptism and introduce yourself to the Minister of the Sacrament, typically a deacon. Please note: in order to secure a Baptism date, you must have atleast one Catholic Sponsor letter attached to your Yellow Baptism Request form. If you have a second Godparent, their Sponsor letter MUST be handed in to the Parish Office no later that one week prior to the Baptism date.